"These are wine slushies that are fast and simple." 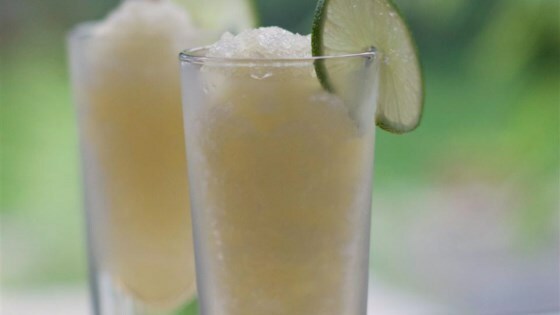 Combine wine, water, sugar, and lime juice together in a bowl until sugar is dissolved; transfer to an ice cream maker. Follow manufacturers' instructions for ice cream. Add more or less sugar depending on how high your RS% (residual sugar) is. Use a sweet wine that is at least 12 RS%. Give mixture a taste before putting it in ice cream maker to ensure the right sweetness. You can add more water if mixture is too sweet.